And either they are going to maybe sell knives. It could probably go either way. 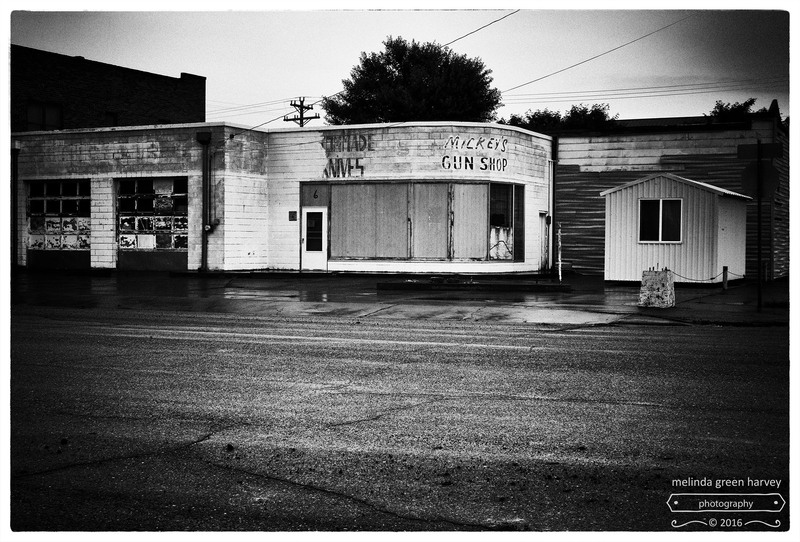 Posted on September 25, 2016, in Photography and tagged 365 photo project, black and white photography, boise city, boise city oklahoma, Leica, melinda green harvey, monochrome, oklahoma, one day one image, photo a day, photography, postaday. Bookmark the permalink. 9 Comments. I think you’d probably be pretty safe around this place: while I was in town I didn’t see any weapons and almost no people!! You just keep cranking them out ! No political statement here. All of us need to see there is a forgotten America. Always has been I suppose. Yeah, well, I try to keep politics out of it. There’s enough of that elsewhere. I just report what I see. Knives are being discontinued, the shop is 4/5ths boarded up. I’d say things are on the slide. Now that you mention it, I don’t think I’ve ever seen a business that goes from 4/5ths boarded up to 3/5ths or 2/5ths – that numerator always gets larger. love the desolate feeling of this one! nice!!! Thanks, Mark. I think this one sums up the way things are in a lot of places around here.